In Loving Memory of Dusty Bottoms . . . Continued from Part 1 Below . . . In addition to Dusty’s sporadic but memorable points, Dusty had some good retrieves that ought to be mentioned. On Thanksgiving Day, 2004, I thumped a rooster that dropped over a ridiculously high and tight barbed-wire fence–a real crotch ripper–that I wasn’t too excited to cross. Before, I could even try to figure out how to maneuver the fence, Dusty crawled under and made a perfect soft-mouthed retrieve to hand like a Labrador retriever. “Good boy, Dusty Boy” I praised as I took the big rooster from him. I thought to myself: Man, you’ve been holding out on me. Later on that morning in a willow thicket, Dusty stretched into one of his most intense points that I can recall. The sight got my heart pumping so hard that I missed the screaming rooster twice as he rocketed away. Sorry Dusty, that point deserved so much better. There’s not much to report in 2005. As I mentioned earlier, Dusty did not get to hunt hardly at all in 2005 because of his surgery, but I did let him run over Thanksgiving on chukars. After not having hunted for over a year, Dusty took to his old ways and flushed copious chukars to wind. I was fuming mad and angry shouts echoed off the surrounding rimrocks. It may have been that Dusty gained other nicknames that day such as: “D. Dusty Devlins” or “Dusty Bottoms.” Looking back, I don’t blame him one bit as he had been cooped up all hunting season for his recovery from surgery. The following year, however, Dusty gave me his most memorable retrieve. That September morning, my dogs and I hunted this old logging road at the top of a mountain pass. When we came to the end of the road, we continued hunting down the same ridge. As we stepped out of the timber into a sagebrush and snowberry covered hillside, Dusty struck a nice point. As I approached, the blue grouse got up so low as it flew downhill that I let it fly away unscathed (because I did not want to shoot Dusty) until it was at the extreme edge of my shooting capacity. As the bird hooked to my left, I swung the gun ridiculously far ahead of it and threw out a Hail Mary. To my utter astonishment, the bird was marginally hit and it careened down in a wooded draw over seventy yards below us. I made my way down to where the wing-tipped bird had landed, but Dusty and Sunny made it there much quicker. When I got to the scene, I witnessed Dusty–like a fox in a hen house–chasing down the fluttering, running blue grouse. “Get that bird, Dusty!” I excitedly hollered. 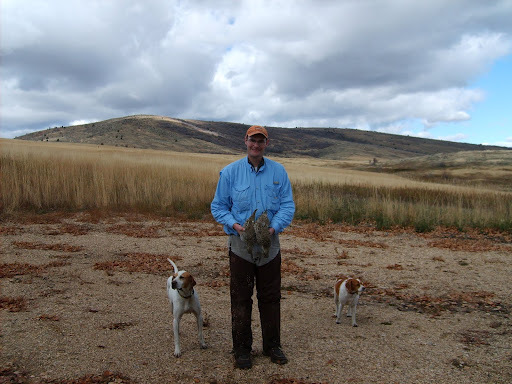 Dusty did not disappoint and retrieved the big blue grouse to hand. Not only was that Dusty’s best retrieve, but it also happens to be the best retrieve I have ever witnessed. Maybe Dusty was just an infamous underachiever. Who knows? Sharptails were the birds of Dusty’s heart. If I had to choose one bird that Dusty excelled on, I would have to say it was sharptails. They were definitely the bird of Dusty’s heart. We share that in common. The bulk of my fondest memories of Dusty took place in October on sharpies. On one of my first hunts on the Royal MacNab with Matt Lucia in 2006, I first left Dusty in the vehicle due to the concern that he would interfere with Matt’s elderly black Labrador, Logan’s hunt. I shot well that afternoon with Sunny Girl and had my limit in no time. However, Matt uncharacteristically struggled with his shooting and had only one of his two bird limit. After a quick dinner at the truck, we set out again looking for more sharptails—again without Dusty. Although we hunted hard, we did not find a lot of birds on this swing either so we headed downhill to the west toward the truck. With the lack of birds, I suggested to Matt, “Maybe Dusty will be able to cover more ground so that we can find you some birds.” Matt agreed and we let Dusty out of his kennel for the rest of the hunt. What followed is one of my all-time favorite memories of Dusty. As I mentioned earlier, sometimes I called him “Bustin’ Dusty” because of his tendency to flush birds like a Springer Spaniel, but he was all about business that late afternoon. 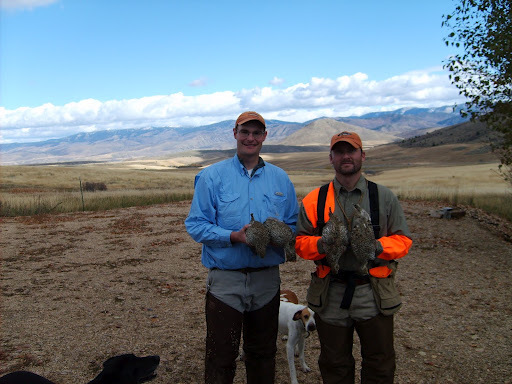 I recall numerous intense points and Matt missing a bird that flushed wild but in range. No big deal, I thought, Matt won’t miss again. As shooting light began to slip away, Dusty froze on a solid point on the rim of a deep ravine. I signaled Matt in to honor the point and he walked in behind the statuesque pointer. As if scripted, the bird rose up giving Matt and easy straight-away shot, which he missed twice. “Dang it!” Matt hollered in frustration as darkness descended. Matt had failed to obtain his limit, but it wasn’t Dusty’s fault. To sum it up, hunting with Dusty was like that. When I was shooting decently, he was usually scattering birds to the four quarters of the earth. Too voluminous to record are the times that Dusty bowled through coveys out of range. Sunny and I usually harvested what leftovers we could where Dusty was not. Writing this, however, has helped me to realize that the problem was not always Dusty. 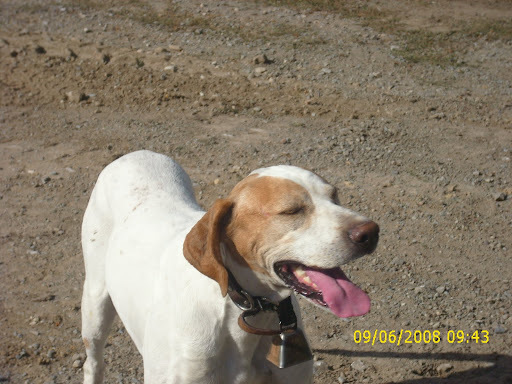 More than any of my other dogs, my own shortcomings as a wingshooter (and a dog trainer), were brought out by Dusty. When Dusty was on fire and hunting for me, I usually got way too excited (I would liken the feeling unto buck fever) and scattered shot every which way but loose. In short, Dusty and I were like water and oil that does not mix. We rarely pulled it together at the same time. When we did, however, it was special. Even when he was in all his knuckleheaded glory, Dusty brought a comedic element to the hunt that I sometimes miss (Notice I said sometimes, mind you). In all seriousness, I assure you that all of Dusty’s aforementioned nicknames were spoken only with affection. Despite his numerous faults, I loved Dusty and I still miss him very much. I like to think the feeling was mutual—even with all of my own glaring imperfections. Dusty Boy, I’ll see you in the covert in the sky and you can flush sharptails to your heart’s content. I’m sure I will be able to use a good laugh. I love you buddy. Loved your tribute to Dusty. I'm sure he loved you too!